Hello guys, in this instructable you are gonna learn how to make an SMS Security System using Texas Instruments CC3200 (TI CC3200) Launchpad within 15minuites! This project aims to develop a prototype which can detect movements in any doors, cupboards or bags, and notify through SMS. the onboard accelerometer sensor will be used to detect movements in any doors or anything you wish. the CC3200 Wi-Fi wireless microcontroller will be used to send SMS to the desired phone by triggering a URL. The URL which is required to send SMS is generated on the IFTTT website. The following steps explain how to generate the URL and program TI CC3200 Launchpad. and finally, you have to create a new Applet and merge these two configured Applets. Open IFTTT website on your browser and sign in to your account. Open SMS Applet link, you will be taken to a similar webpage as shown in the picture. On the next page, in the Your phone number textbox enter your mobile number (type 00 followed by your country code and then your mobile number, e.g. 009173730xxxxx) to which you wish to receive SMS when your door is opened, then click Send PIN button. You will receive a 4-digit PIN to the entered mobile number from the IFTTT website within a few seconds, enter the PIN in the PIN textbox, then click on connect button. Now you have successfully created SMS Applet and registered your mobile number. Open Webhooks Applet link, click on connect button. Now you have successfully configured Webhooks Applet. Open Create new Applet link. You can see the term If this then that on the screen, here this and that are 2 different events. In our case, this event is a URL triggering using Webhooks applet and that event is sent SMS using SMS applet to the registered number. Let's configure the two events. Now click on +this (blue + icon)on the screen. On the next page search for webhooks, click on Webhooks option(refer image). On the next page click on Receive a web request option. On the next page enter the desired event name (I entered TICC3200) in the Event Name text box, click on Create trigger button. Next, you have to click on +that (blue + icon). On the next page search for SMS, click on the SMS option. On the next page click on the Send me an SMS option. On the next page in the Message textbox enter the text which you wish to receive when the door is opened, click on Create action button. On the next page review your text message and click on the Finish button. Open Webhooks link, click on Documentation button. On the next page, you can see an autogenerated key and an URL with a textbox in between. In the textbox in between the URL, you have to enter the event name which you entered in the creating new Applet step. (Don't share the key or the URL with anyone). Now you can trigger this URL using TI CC3200 board to send the SMS to your mobile. The URL is generated successfully! Next, you have to program the TI CC3200 Launchpad. To download the code for the door alarm visit my GitHub repository. Download it and extract the zip file. To program the TI CC3200 Launchpad, you need Energia 1.8.7E21 software. To download it visit Energia download link. Download it and extract the downloaded zip file. To open the software, double click on the file energia.exe. Click on File -> open -> select the downloaded program. Before uploading the program you have you edit a few lines. Enter your Wi-Fi SSID in line 6 and Password in line 8, then in line 10 enter the URL generated on the IFTTT website. To program the TI CC3200 Launchpad using Energia software, first, we have to connect some jumpers to the header pins on the Launchpad. Refer to this image provided by Energia developers and connect the jumpers. Now connect the TI CC3200 Launchpad to your laptop or computer through a USB cable. 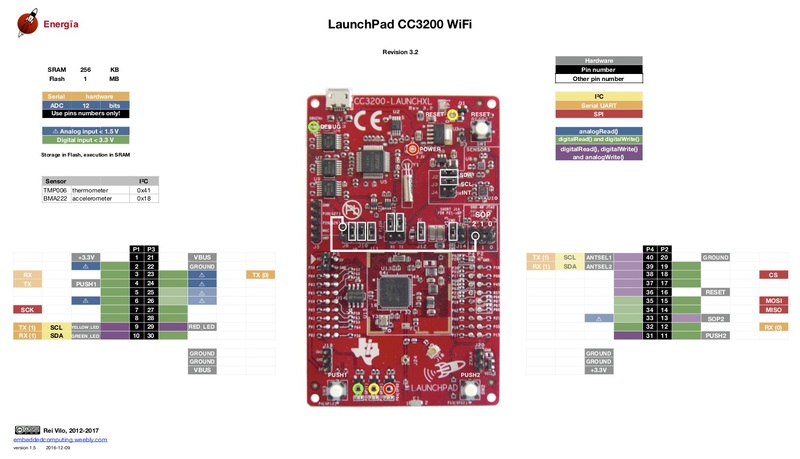 Under Tools -> Board, select CC3200-LAUNCHXL (80MHz). Under Tools -> Port, select the appropriate port. Click on Upload icon or select Sketch -> Upload or press Ctrl+U on your keyboard. Wait until the program gets uploaded. Disconnect the Launchpad from your laptop or computer and power it with a 5V power source and place the setup on a door, cupboard, bag or any other which you want to monitor its movement. If there is any movement after 1 minute from powering up the Launchpad, you will receive the SMS to your mobile. Make it and have fun!